This article by Robert Loerzel originally appeared in Pioneer Press on March 6, 2003. Winner of the Chicago Headline Club’s Peter Lisagor Award. “Left in the Dark” wasn’t a radio hit or a gold record. Its composer, Ken Draznik of Palatine, hadn’t earned a penny in royalties from the 1979 song — until last month. And yet, the song seems to have a life of its own, surprising Draznik as it surfaces again and again in versions by other rock musicians. After Draznik recorded it with his Champaign rock group, the Vertebrats, “Left in the Dark” was played by two of the most influential bands of the ’80s and ’90s, the Replacements and Uncle Tupelo. At least three other groups have also recorded Draznik’s song about a bitter breakup. And now, none other than the flamboyant queen of grunge rock, Courtney Love, has recorded “Left in the Dark.” Love, the former lead singer of Hole, plans to release her version soon, said her producer, Jim Barber. Like so many songs, “Left in the Dark” began when a young musician broke up with a girlfriend. Draznik, who is now married with children, is embarrassed to talk about this episode from his youth. But like many another songwriter, he felt angry at an ex-lover, which fueled some spite-filled lyrics. The narrator of the song demands to know the name of his old flame’s new boyfriend. “I kind of feel bad about it now,” Draznik says sheepishly. Influenced by punk, as well as the tuneful British Invasion rock of the ’60s, Draznik and three other musicians formed the Vertebrats in 1979 on the University of Illinois campus in Champaign. After trying his hand at writing fiction, Draznik found a more fulfilling outlet in songwriting. “Songs were just a much more distilled scene-setting than a short story,” he said. The group recorded a few songs, including “Left in the Dark,” at a studio in Urbana, without any plans to release them. One person who received a copy of that tape was Jon Ginoli, a disc jockey on the college radio station, WPGU. He began playing “Left in the Dark” fairly regularly on the station. “Bands doing their own songs that were any good were few and far between. There wasn’t that much (local music) activity until the Vertebrats came along,” said Ginoli (who later played in another Champaign band, the Outnumbered, and is now in the California-based Pansy Division). “Left in the Dark,” as performed by the Vertebrats, begins with a bit of quiet, jangly guitar chords, played somewhat tentatively. Matt Brandabur’s lead electric guitar blurts out a few notes, then the song settles into a strong garage-rock groove, three major chords churning around repeatedly. The drums kick in and Draznik sings in a sneer, with a palpable sense of indignation bubbling through the words. After going back to the original three-chord pattern and then repeating the higher melody, “Left in the Dark” enters what might be called the chorus — but it’s really more of a denouement or release following the climax of a moment ago. Avery Lerner of Mundelein, who was a student in Champaign at the time, still calls the Vertebrats one of the best unsigned bands he has ever seen. “The gigs were intense,” Vertebrats fan Miles Harvey wrote in the liner notes for one of the band’s posthumously issued CDs. “On one side of the stage stood boy-wonder guitarist Brandabur, his mop top flopping as he squeezed out a solo. … Roy Axford, on the opposite side of the stage, looked as though he was beating up his bass in a barroom brawl. Ginoli entered “Left in the Dark” in a national “battle of the bands” contest sponsored by Voxx Records. A new subsidiary of Bomp Records, the label was run by Greg Shaw, a legendary record collector and the editor of the underground rock music publication Bomp. Ginoli was sure Shaw would dig the sound of the Vertebrats, and he was right. The inclusion of “Left in the Dark” on that LP is the key to its endurance as a cult classic. Although the record was never a best-seller, it did fall into the hands of some influential musicians. At the time, though, Draznik didn’t receive much reaction. In 1982, at the height of their local popularity, the Verrtebrats broke up. In a way, they had arrived on the scene too early. In the late 1970s and early 1980s, it was not easy for a local band to record original songs and release them on an independent label. Within a couple of years after the Vertebrats’ demise, independent rock music proliferated. It wasn’t until the 1900s that the long-defunct band finally put out two CDs of studio and live recordings on Champaign-based Parasol Records. But even though the Vertebrats were no longer together, the story of “Left in the Dark” was just beginning. One of the bands that heard the song on the Bomp compilation was an up-and-coming post-punk Minneapolis bar band called the Replacements. 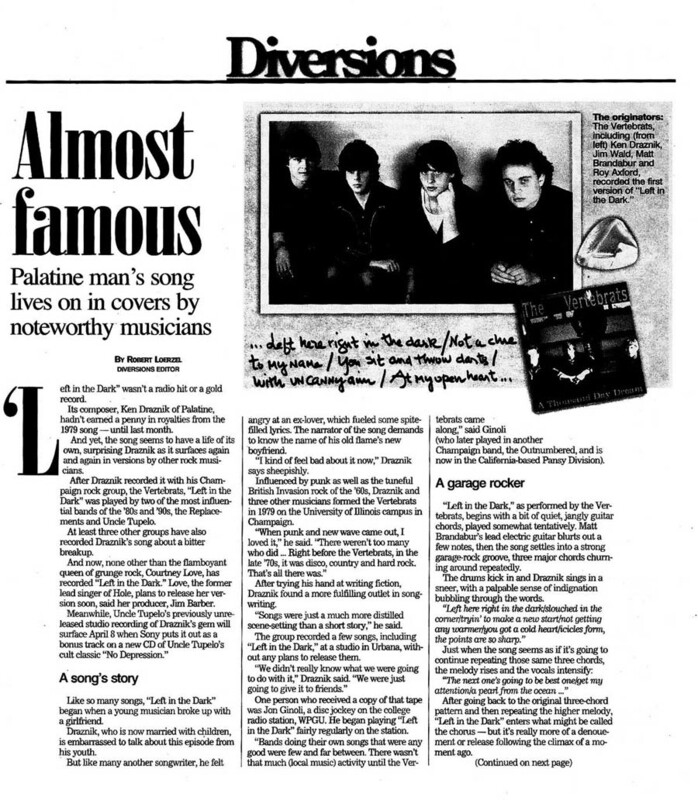 Lerner saw the Replacements perform “Left in the Dark” around 1984 at a Chicago club called the West End. Ginoli set up a Replacements concert in Champaign in 1985, but he forgot to ask Paul Westerberg, the lead singer, to sing the Vertebrats song. The Replacements did their most famous rendition of “Left in the Dark” during a gig on Nov. 11, 1984, at the Bowery in Oklahoma City. Roadie Bill Mack discovered someone in the audience taping the concert and confiscated the recording, stopping it mid-song. The Replacements played “Left in the Dark” loud and ragged. Westerberg slurred the lyrics beyond intelligibility, turning entire verses into one long blur of caveman consonants and vowels. Listening to the tape recently, Draznik shook his head in wonder at the sloppiness of this rendition. The Replacements became one of the most beloved indie-rock bands of the 1980s before falling apart in 1991. As a cassette-only release, their recording of “Left in the Dark” was little more than a cherished oddity, though it did introduce the song to many listeners. It is not available on CD other than as a bootleg. Meanwhile, Draznik’s song was also heard by Uncle Tupelo, a band from Belleville, Ill., that was blending folk, old-time country and punk. 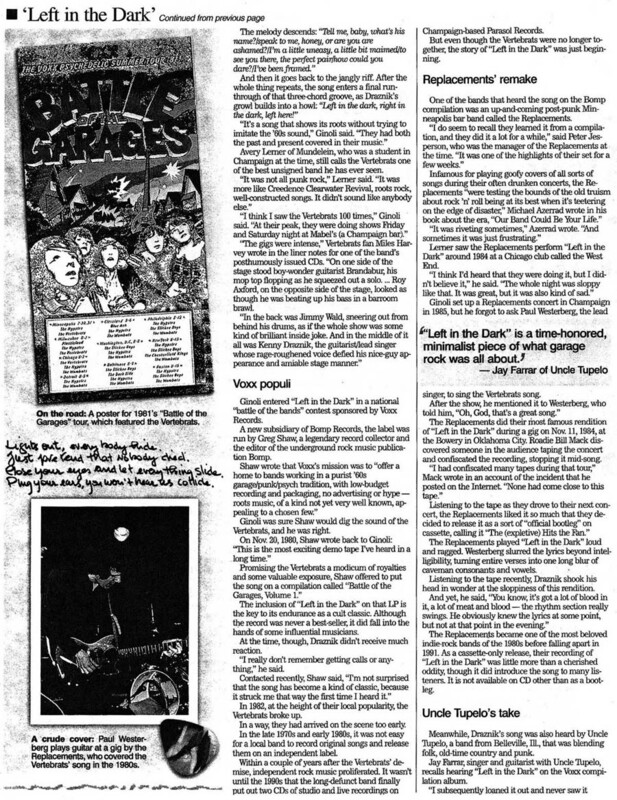 Jay Farrar, singer and guitarist with Uncle Tupelo, recalls hearing “Left in the Dark” on the Voxx compilation album. “I subsequently loaned it out and never saw it again,” Farrar wrote, responding to an e-mail from Pioneer Press. “The fact that a band from Champaign, Ill., recorded the song served as inspiration to Uncle Tupelo, but above all the Vertebrats’ version of ‘Left in the Dark’ is a time-honored, minimalist piece of what garage rock was all about,” he said. Uncle Tupelo, which had previously recorded some demos in Champaign, played a version of “Left in the Dark” during the January 1990 sessions in Massachusetts for the band’s first album, “No Depression.” But the song did not make it onto the album. But the band did play “Left in the Dark” at some concerts, and a bootleg circulated of a performance from Feb. 16, 1991, at the Blue Note in Columbia, Mo. In the studio and live recordings, Uncle Tupelo puts its own distinctive stamp on Draznik’s song, playing a hard-charging version of the main chord progression and changing up the tempos in a somewhat herky-jerky fashion. “They just tear right into it,” Draznik said, listening to a tape of Uncle Tupelo. He noted that Farrar simplified the various lead guitar parts that Brandabur had played on the original song. But while Farrar said he couldn’t figure out all the lyrics, Draznik said the Uncle Tupelo rendition was probably more faithful to his original words than any other. Uncle Tupelo influenced countless other bands and is often cited for inspiring the whole alt-country or “No Depression” movement of roots rock. After the band broke up in 1993, its former members went on to form Wilco and Son Volt. Last year, Uncle Tupelo’s studio version of “Left in the Dark” finally appeared. But once again, the song was just beyond the reach of the typical music consumer. Legacy, a subsidiary of Sony, issued a collection of Uncle Tupelo’s best music called “89/93: An Anthology.” The band’s cover of “Left in the Dark” was mixed at Sony Studios in New York in January 2002, but it was left off the CD. 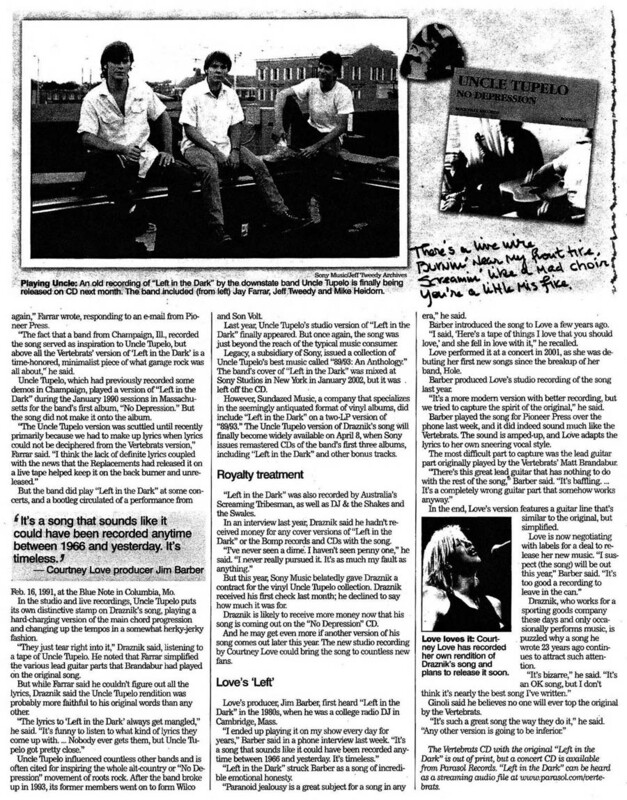 However, Sundazed Music, a company that specializes in the seemingly antiquated format of vinyl albums, did include “Left in the Dark” on a two-LP version of “89/93.” The Uncle Tupelo version of Draznik’s song will finally become widely available on April 8, when Sony issues remastered CDs of the band’s first three albums, including “Left in the Dark” and other bonus tracks. “Left in the Dark” was also recorded by Australia’s Screaming Tribesman, as well as DJ & the Shakes and the Swales. In an interview last year, Draznik said he hadn’t received money for any cover versions of “Left in the Dark” or the Bomp records and CDs with the song. But this year, Sony Music belatedly gave Draznik a contract for the vinyl Uncle Tupelo collection. Draznik received his first check last month; he declined to say how much it was for. Draznik is likely to receive more money now that his song is coming out on the “No Depression” CD. And he may get even more if another version of his song comes out later this year. The new studio recording by Courtney Love could bring the song to countless new fans. Love’s producer, Jim Barber, first heard “Left in the Dark” in the 1980s, when he was a college radio DJ in Cambridge, Mass. “Left in the Dark” struck Barber as a song of incredible emotional honesty. “Paranoid jealousy is a great subject for a song in any era,” he said. Barber introduced the song to Love a few years ago. “I said, ‘Here’s a tape of things I love that you should love,’ and she fell in love with it,” he recalled. Love performed it at a concert in 2001, as she was debuting her first new songs since the breakup of her band, Hole. Barber produced Love’s studio recording of the song last year. “It’s a more modern version with better recording, but we tried to capture the spirit of the original,” he said. Barber played the song for Pioneer Press over the phone last week, and it did indeed sound much like the Vertebrats. The sound is amped-up, and Love adapts the lyrics to her own sneering vocal style. The most difficult part to capture was the lead guitar part originally played by the Vertebrats’ Matt Brandabur. In the end, Love’s version features a guitar line that’s similar to the original, but simplified. Draznik, who works for a sporting goods company these days and only occasionally performs music, is puzzled why a song he wrote 23 years ago continues to attract such attention. Ginoli said he believes no one will ever top the original by the Vertebrats. Postscript: Courtney Love did not release her version of “Left in the Dark,” although bootlegs of it surfaced. In the meantime, even more bands have covered the song, as I reported later in a story for WBEZ Chicago Public Radio.